1.Prepare Steak: In medium bowl, whisk together oil, vinegar, brown sugar and steak seasoning. Place 2 steaks in each of 2 large zip-top plastic bags; pour half the marinade into each bag. Seal bags, pressing out extra air; refrigerate at least 1 hour or up to 4 hours. 2.Meanwhile, prepare Herb Butter: In medium bowl, stir all ingredients until well combined. 3.Prepare Asparagus: In large bowl, toss asparagus with oil, salt and pepper. 4.Prepare grill for direct grilling over medium-high heat. Remove steaks from marinade; discard marinade. 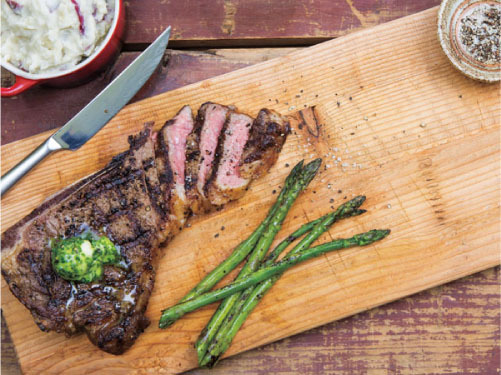 Place steaks and asparagus on hot grill rack; cover and cook steaks 6 to 8 minutes or until grill marks appear and internal temperature reaches 135°, turning once halfway through cooking; cook asparagus 6 minutes or until tender-crisp, turning frequently. Transfer steaks to cutting board; let stand 10 minutes. Internal temperature will rise to 145° upon standing for medium-rare. 5.To serve, slice steak across the grain; top each steak with 1 tablespoon Herb Butter.